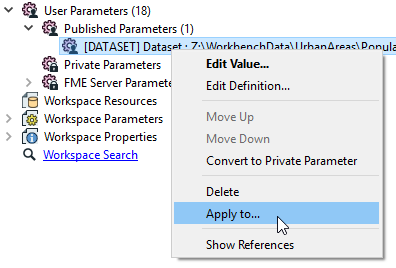 You can link any number of workspace parameters to use the same value as a Published or Private Parameter. Filter the list and click each Joiner Source parameter. Then click OK.
On the first Joiner, the Joiner Source has already been published. When you run this workspace, you will be prompted for the location of the database used in the Joiner. Then the source for Joiner_2 and Joiner_3 are set to use the published parameter value defined in the first Joiner. When the workspace is run, you are still only prompted for one Joiner source, but the same value will be used for the other Joiners. 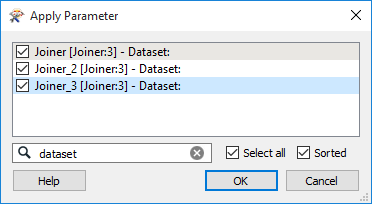 Regardless of how many other parameters are set to use the first Joiner, changing this one parameter affects all the parameters that depend on it. Note: The names in the Apply Parameter list will be reflected in the properties of both Published and Private Parameters. To remove any parameter from the group, right-click and select Unlink from User Parameter.